THE MARTINI CHRONICLES: Hurricane Prep...and My Warped Thinking! Hurricane Prep...and My Warped Thinking! 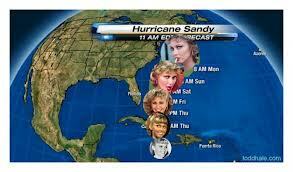 As many of you may know, the East Coast is bracing itself for Hurricane Sandy. 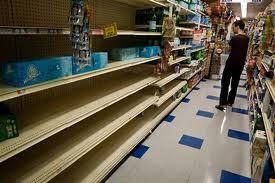 The shelves in the supermarkets are empty. The gas stations are crowded. Both New York City Transit and New Jersey Transit plan to suspend service this evening, and the bridges and tunnels may be next. I've received email notifications from my electric, gas, and cable companies pretty much telling me that they are on the job in the event of power and system outages. There isn't a battery or flashlight in sight, and all of today's football games have been replaced by around-the-clock weather news. Like I said...bracing! And of course, I've made a few preparations myself. I managed to find batteries for our flashlights, and I also purchased a few cases of water and extra dog treats for Q. I am charging up all of my electronics just in case we lose power, and I've already filled up my gas tank and gotten cash out of the ATM. I have checked in with my family in Brooklyn and Queens to make sure that they are ready for any potential foolishness that Sandy will bring. Again...bracing! With all of this going on, is it weird that I am overly-concerned with work? As I write this post, I have no idea whether my office is going to be closed or not, and it's making my anxious. So anxious, in fact, that I still haven't decided how angry I'm going to be if the weather news interrupts the Giants game. Logically, it would make sense for the office to be closed. The area is prone to flooding and there are trees everywhere...trees that can potentially fall due to heavy winds. But, I haven't heard anything yet. So now I'm wondering if I am going to be able to work from home...but what if the power goes out. Then what? Why is this bothering me so much? Ugh! So there you have it...the Professional Diva is a workaholic, and cannot let her mind focus on the weather or the Giants game because she's consumed with work. Go ahead...judge me! But as warped as my thinking may be, I'm not the only one. At least two of my fellow professional friends are struggling with the same thing. One of my friends works on Wall Street, and she is mulling over her work options for tomorrow morning. Since the trains and buses won't be running, she is considering whether she should drive to work. But is that the best thing to do since its supposed to be super windy and rainy tomorrow? She's nervous. And then I have another friend who's a consultant and needs to be in San Francisco for an important meeting tomorrow. Clearly that's not going to happen, and the folks he's supposed to meet with will completely understand why he is unable to meet, but guess what he's doing...he's planning to attend the meeting anyway via the Go-To-Webinar online meeting system. Clever, but he's been so consumed with setting up this meeting that he forgot to purchase water and batteries, and his gas tank is empty. As I write this post, he's waiting in line to get gas. He's not happy. See, it's not just me! So now you all know a little bit more about me and my warped way of thinking. To recap...storm coming...I'm kind of ready...concerned about my work situation...and the Giants game is NOT on! Wait...I take that back...it's on! Go Big Blue! 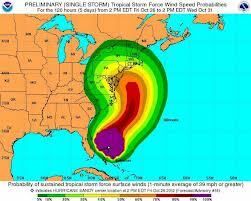 For those of you in the path of Hurricane Sandy, how are you preparing for the storm? Are you thinking about work like I am? Am I completely nuts? !